Trinity Metro provides high-quality and reliable public bus transportation throughout Fort Worth. Using the bus is a great way to get around Downtown, too! Looking to explore more of Fort Worth? 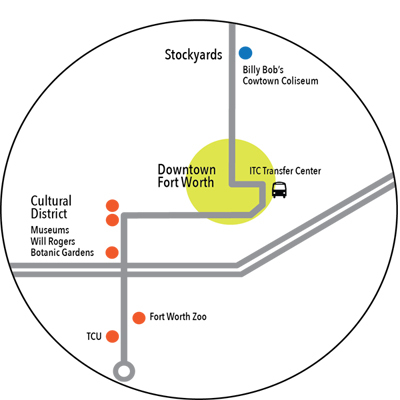 Catch the 15 bus from Downtown to visit the Historic Stockyards or the Route 7 bus to visit the Cultural District. Download the NextBus App to get real-time bus arrival information. Visit Trinity Metro's website for more information.